Side Dish Archives - Are You Kitchen Me?! 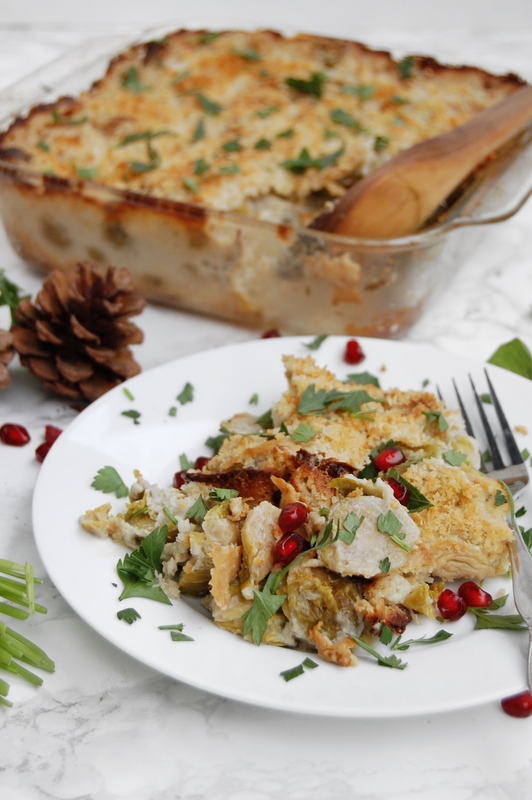 A new classic to introduce at Thanksgiving this year- Brussels Sprouts Au Gratin is as comforting as the traditional casseroles with a fun new spin! They’re sprOUT of this world! Thanksgiving is next week and, unlike previous years, I don’t have a plan yet. Ah! 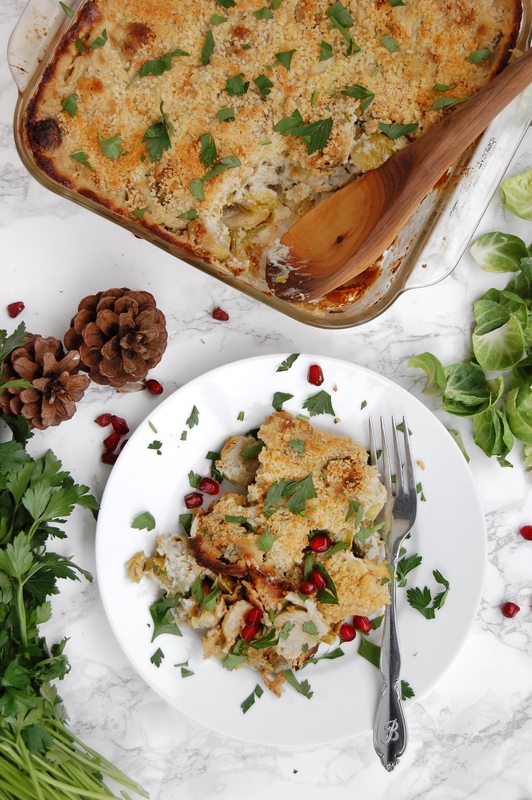 I have an idea of what I’ll be making to bring to my parent’s big feast but the one thing I know for sure is this Brussels Sprouts Au Gratin. When I transitioned from vegetarian to vegan, I started veganizing some of the classics so that I could enjoy the meal with my family. I also started to slide a few new recipes in here and there… And they’ve been a hit! Some of my additions have been Creamed Kale, Apple Quinoa Fall Salad, Mushroom Gravy, and Sweet and Spicy Brussels Sprouts. Not exactly traditional but I didn’t hear any complaints. So I’m back with another NEW Thanksgiving recipe! The good news is, this dish feels like the creamy, comforting, ooey-gooey recipes we’re all used to at the holidays. No wisecracks about “rabbit food” around here! I picked up all of the ingredients for this recipe at my favorite grocery store, Lucky’s Market! Every Saturday after hitting up the Clintonville Farmer’s Market (which has its last market this weekend- *sobs*), we stop into Lucky’s for the things we couldn’t get from the farmers. Their slogan “Organic for the 99%” speaks to all the things I love about this brand. They are committed to healthy, organic food but at prices you can afford without a trust fund. Lucky’s also happens to have the juiciest, plumpest, most perfect Brussels sprouts this time of year. Seriously, I skip over the dinky sprouts at the market every time to hold out for these. I also hold out for Lucky’s brand products- ALL with a high-quality standard and great pricing. 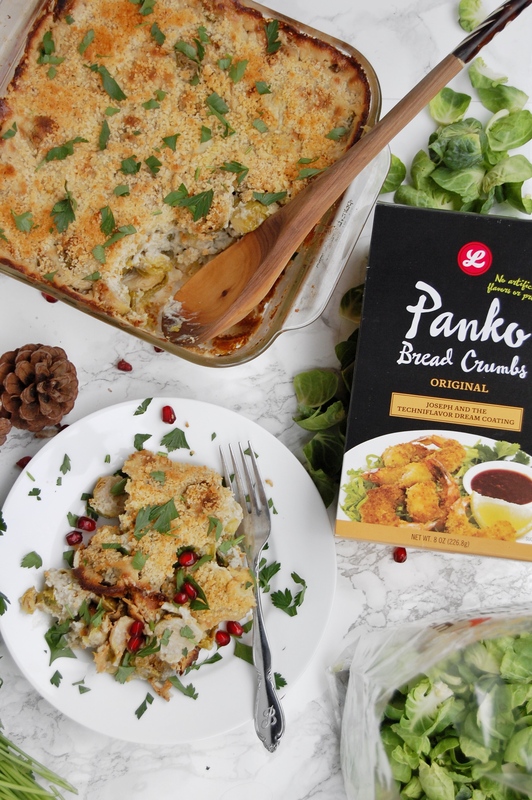 For this recipe, I grabbed their crispy Panko Breadcrumbs to add a little crunch and texture atop the creamy base. Oh, and I use their app to earn rewards and save seriously good money! Do you cook traditional dishes for Thanksgiving? 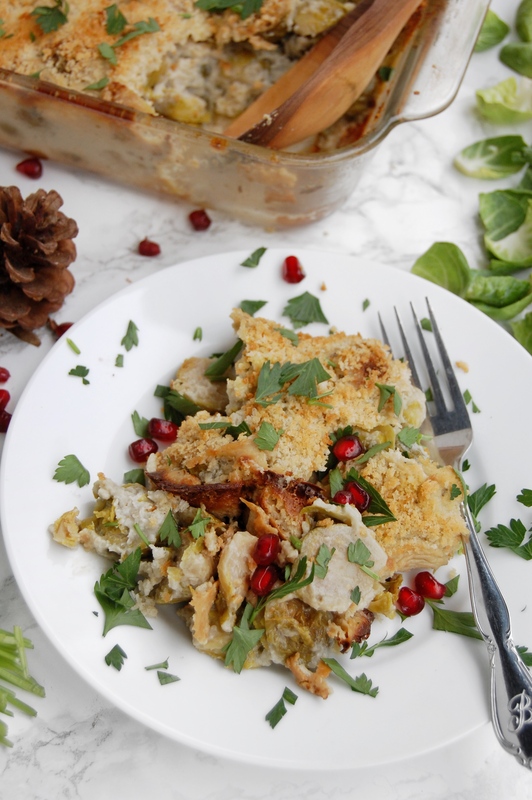 Try switching it up with creamy, dreamy, and deliciously healthy Brussels Sprouts Au Gratin this year and let me know what you think!! Add chopped potatoes, garlic, cashews, and salt to a pot and cover with 1½ cups of water. Bring to a boil over high heat then reduce to a simmer. Cook for 10 minutes, until potatoes are fork tender. Let cool. Meanwhile, heat oven to 425F and lightly grease an 8x8 or round baking dish. Add contents of pot (including the cooking water) to a blender with nutritional yeast, miso, and coconut oil. Blend until completely smooth, scraping the sides as needed. If the mixture is too thick to blend, add a few tablespoons of water and try again- you want it very thick though, as the sprouts release liquid when cooked. Add the Brussels sprouts and the blended mixture to prepared pan and toss to completely combine. (You could do this in a separate bowl and then transfer to the pan if you don’t mind dirtying another dish.) Top generously with breadcrumbs and vegan parmesan. Cover the baking dish with foil and bake for 45 minutes. Remove foil and bake an additional 10 minutes, until top it beginning to brown. Lucky’s provided me with gift cards in exchange for social media posts. As always, I would never promote brands or products I don’t love and truly believe in. 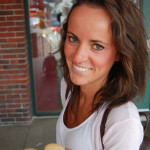 Thanks for supporting the brands that make this blog possible! 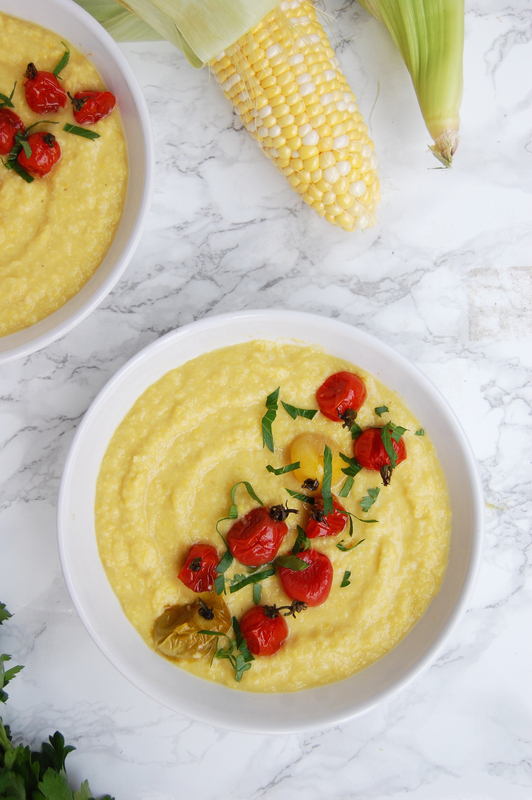 With just one ingredient and less than 30 minutes, a luxuriously silky bowl of Fresh Sweet Corn Polenta is deceptively simple! A sweet, creamy ode to the end of summer! 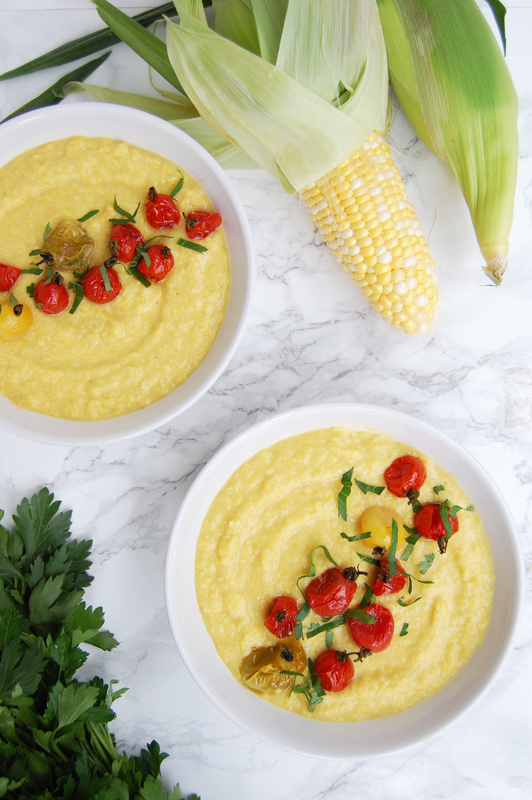 Ohio sweet corn is among the most perfect foods in the world. Bare in mind, this is coming from a corn-fed Midwesterner who has been gnawing on cobs since she was old enough to clutch one. But still. There are few things better than fresh corn. We picked up our last batch of corn from the farmer’s market last weekend and I have to say, I was pretty devastated. Not to be melodramatic or anything. But seriously, the end of corn season marks a transition into fall, which always leaves me feeling a little melancholy. Especially since I JUST discovered my favorite way to devour the sweet stuff. 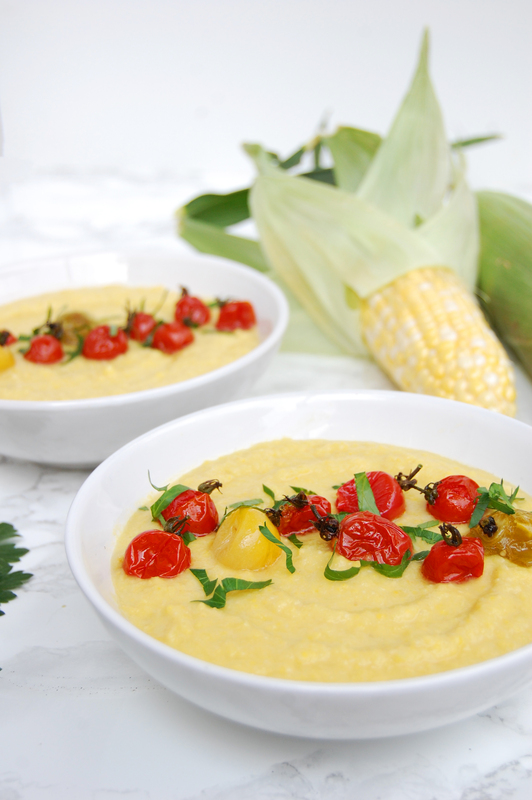 Polenta. Not something I eat with any sort of regularity. But I’m always down for a bowl of steaming hot porridge. 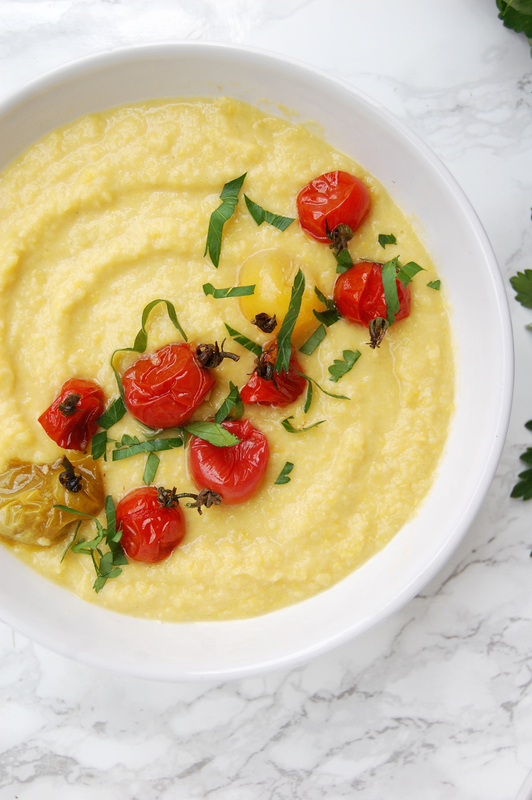 To be completely honest, prior to this recipe, my polenta preparation skills solely consisted of snipping opening a tube and slicing a log of the stuff. We’ve come a long way with this recipe my friends. I told you it doesn’t get any easier. Prepare the corn by shucking husks and removing all silk. Rinse under cool water. Using a large serrated knife, cut the corn off the cob. Then run the back of the knife over the cob to “milk” all of the juice and small bits into the bowl. Add corn to a sauce pan and add salt and just enough water to cover. Bring to a simmer for 8-10 minutes, until corn is plump. Use a slotted spoon to scoop kernels into a blender or food processor. Begin blending, adding cooking liquid as needed. Blend until completely smooth (or a little chucky if you like it that way- I do) and return to pan. Add butter and warm until melted. Serve with roasted tomatoes and chopped fresh parsley. 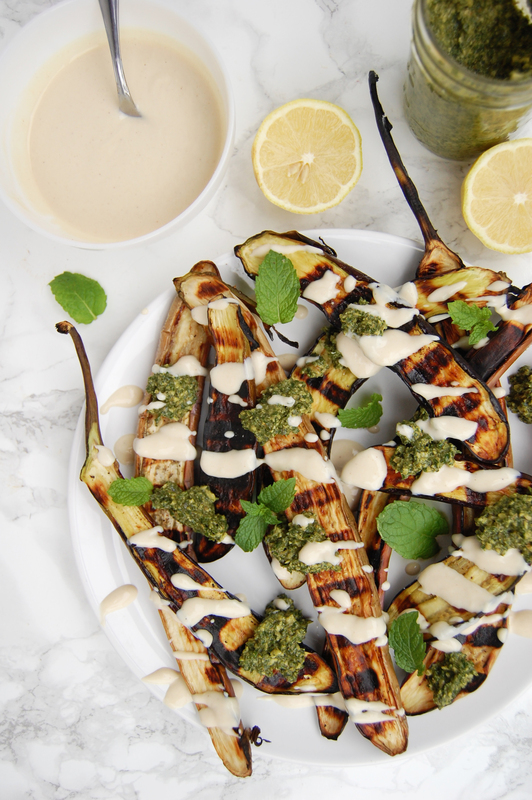 Smoky, charred veggies smothered in herby and tangy sauces is basically what summer dreams are made of. 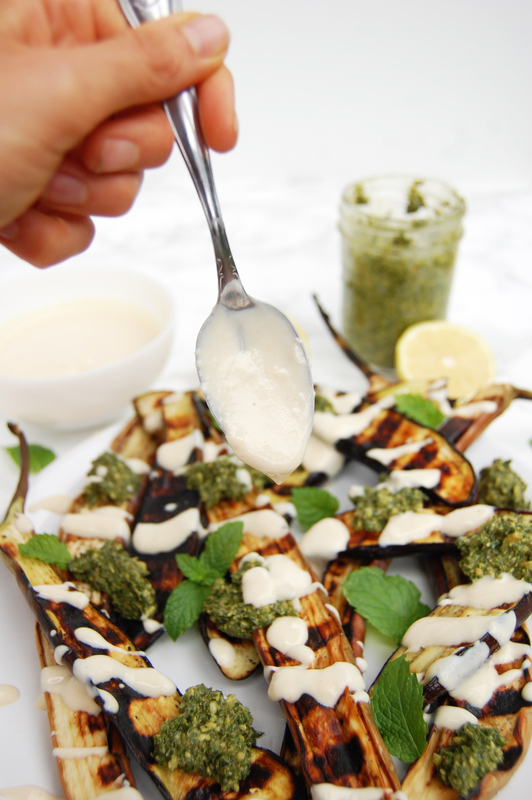 Grilled Eggplant with Pesto & Tahini Yogurt Sauce is a dream come true! There’s not much more I need in the summer than a little sunshine and some grilled veggies. It’s something about the heat and the smell and the fresh air. It just gets me. Some of our grill staples include zucchini, green beans, corn, and tofu. Our go-to’s. But it’s not often we toss on something more wild and… purple. Cooking eggplant on the grill may have forever changed my perspective on the sometimes-mushy globes. Eggplant parmesan can be greasy or soggy and ratatouille is really all about the tomatoes. Baba ganoush is delicious but I just can’t make it as well as Brassica… But I think I’ve finally cracked the code! Grill. all. the. things! I’ve had the best luck with long, thin eggplants, as opposed to the larger round ones. They have fewer seeds and flesh, making them less bitter and much firmer. I believe they’re sometimes called Chinese eggplants, but they’re all over my farmers market right now. Next on my eggplant bucket list (oh wow, how did we get here?) are fairy tale eggplants. Just precious. Side note: why must people make dirty jokes out of the eggplant emoji?! What did that poor little plant ever do to them?? Don’t they know some people want to use it for it’s true form as a deliciously tender and mild vegetable??? Anywho… Let’s talk about the most important part of any recipe. The sauce. I’m a self-proclaimed sauce whore so you know I’m smothering every bite of eggplant with more than a dainty drizzle. 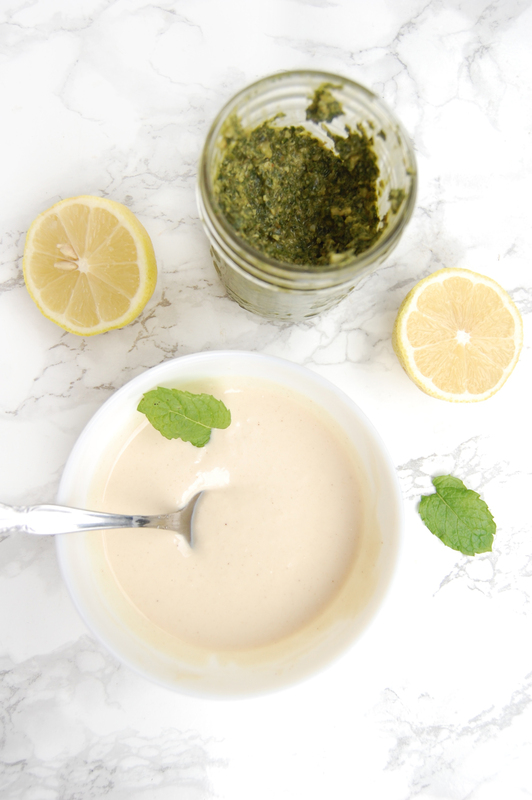 The combination of herby pesto and creamy yogurt is everything. I made my own homemade pesto but you sure don’t have to. But you mussssst make the yogurt sauce. I’ve been using yogurt in more savory recipes and I’m a big fan. Don’t get me wrong, I love some parfait action, but yogurt brings such a welcome tang and creaminess to dinnertime dishes. I use Silk plain soy yogurt because I can buy it in a 24oz. tub. If you’re not against dairy, use whatever plain brand floats your boat. Heat a grill to medium-high heat, making sure the grate are cleaned and oiled. 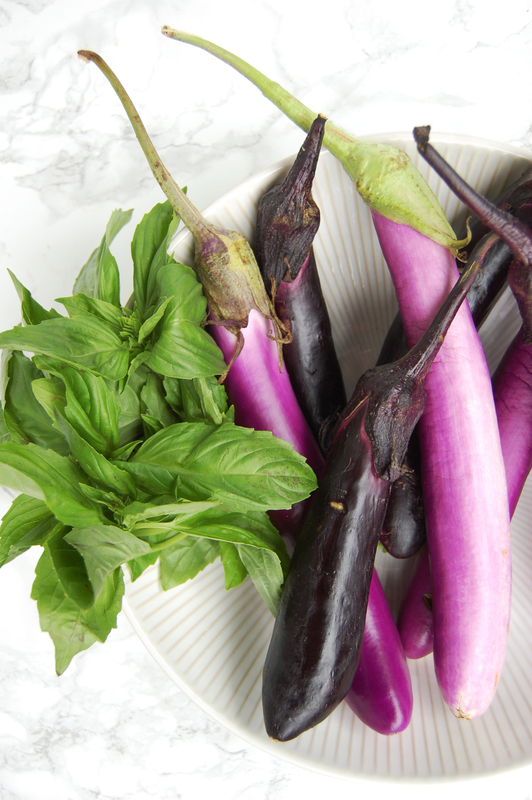 Slice each eggplant in half lengthways and sprinkle with salt. Allow to sit for a few minutes, then blot them dry. Brush with oil and season generously with salt and pepper. Cook the eggplant on the hot grill cut side-down for 4-5 minutes and check to make sure they are well charred. Flip and cook for an additional 4-5 minutes. Remove to a plate and season again with salt and pepper. Meanwhile, make the sauce by adding ingredients to a small bowl or jar and whisking well to combine. 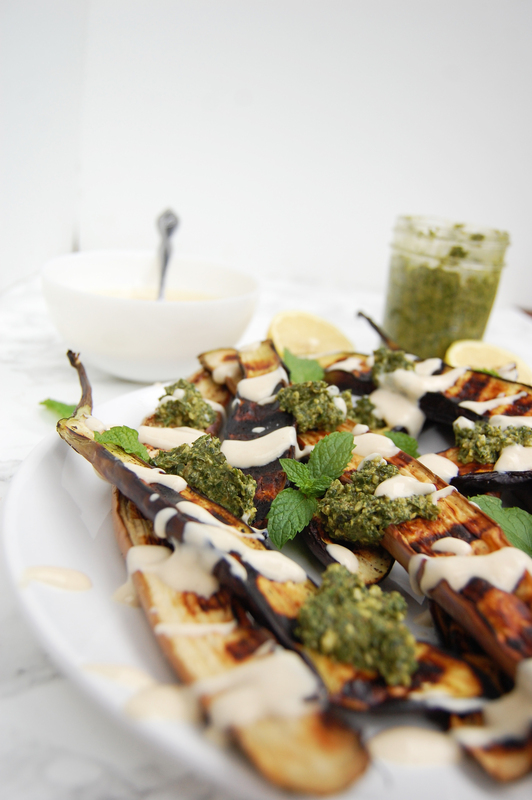 To serve, dollop pesto on eggplant, drizzle with yogurt sauce, and garnish with mint leaves.